It should be made clear here that the park has NOT been ‘severely damaged’. The photo of what appears to be grass being torn up by diggers is actually already a car park which has been repaired for use in the event and paid for by the promoter. The track will use existing carriageways and car parks. Work around the park really has been minimal and in the long term will be practically invisible. I understand the objection to the race, but painting the picture that the park is being destroyed is untrue, unfair and wrong. PS: I concede that in the long term the damage could be minimum, if you mean within 50 years, time for nature to grow. There is a comment in the HIA which the article quotes about grass areas. I have quoted it here. I think that constitutes damage. Or is the Heritage Impact Assessment wrong? Is it unfair? You are incorrect as we live nearby. There are four or five areas large areas of grass in the Rosery car park that have been removed. These served the purpose of slowing cars down. 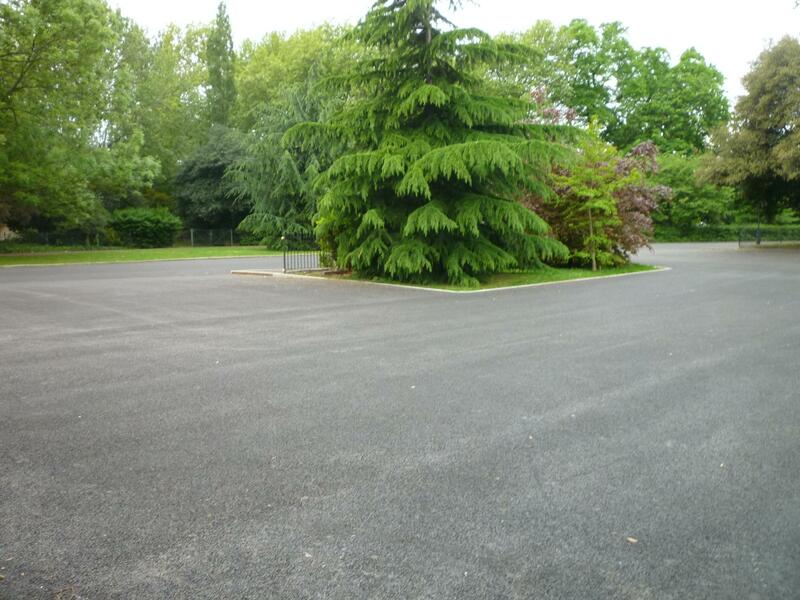 The car park has been widened so that it is now able to form a part of the race track. Planting was removed from the entrances to the car park. Now we have a speeding problem as well as damage.The access points have been increased in size from two car width to 30m so that racing cars can run through the car park. This in anyone’s eyes is damage I’m afraid. 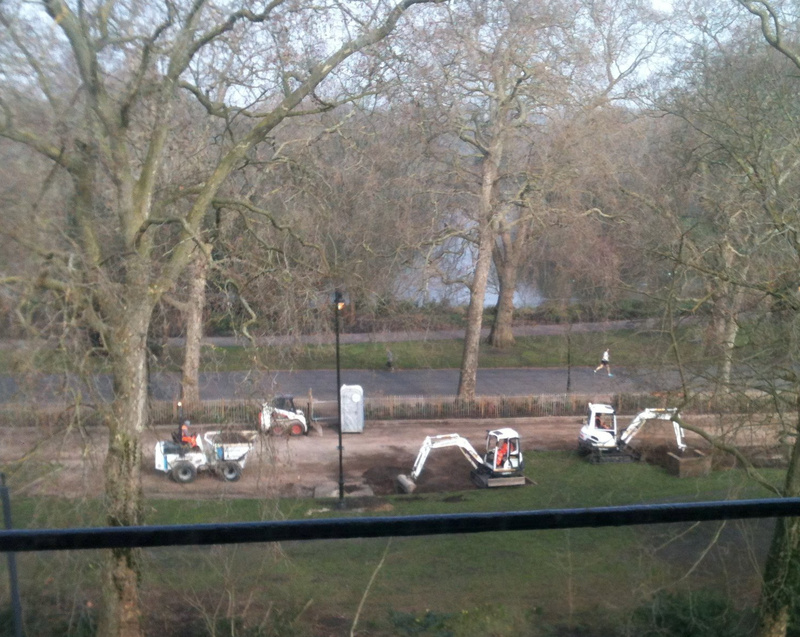 The photo you see of diggers is of grass being removed in one of these areas of car park. Is it not also true that these car parks have also, in addition to being marginally widened (and given I know a lot about temporary circuits, there are solutions to the widening of the entrances when the race is not on which will be almost unnoticeable) to facilitate the race it has also been resurfaced with new, better quality tarmac paid for by the race promoter? It’s difficult to separate loss from gain in this case. I’m not suggesting that no grass had been lost, but the pictures make it seem like a whole lot more has actually gone than it really has. That new tarmac was not needed,car parks had perfectly ok surface John. We’ve seen lorries dammaging plane trees along the carriage way,have you got excuse for that? That is just the start. Then 40000 spectators will surely tiptoe to see the race. I quite like the car racing but this is just so wrong on so many levels. It is mentioned in the article that more money was offered by the promotor but at the suggestion fewer events could take place through the year. It mentions that the events are not reduced, but it would appear that perhaps this money has gone towards maintenance (as paid by Formula E) rather than reducing the number of events. This is a potential net gain to the park and cannot be ignored in the debate. There is a wonderful quote from Oscar Wilde, describing a cynic, but it could equally apply to the main protagonists in this matter: “the price of everything and the value of nothing”. Sure, get some income for letting out bits of the park. But a racing track, with 25-30,000 people per day? And to close the park to non ticket-holders is also unacceptable. The WBC says the park is open throughout; well, yes and no. If you can trek up to the Chelsea Gate, there will be a very small area where dogs and their owners and maybe children could go. But it isn’t very big. The whole thing is totally OTT and not suitable for a small Victorian Grade II Listed park. Why didn’t they go to Wembley? Or the other places on the list. Were we cheaper? Should have mentioned the money. I do not think it can have been paid yet, because a letter received yesterday from Cllr. Cook said they “could” receive £200,000 p.a. Not “would,”, you notice.Simple maths say that a fiver on council tax would achieve more than £200k, Our council tax was £2 less this year. This to me constitutes as a gain. Does this gain outweigh the losses? I believe so. Formula E is bringing investment to maintenance and improvement that would otherwise perhaps been on the chopping board. I think HIA was referring to what would happen to the grass after five years of heavy use of such events. Not sure what they will do about the widened bits, or the drilled holes for the support posts. I think the holes will have flaps on them. It is a bit of a wasteland, seen close up. Maybe a beautiful Victorian Park should not have been selected as a race track, nor should it be closed to non-ticket holders. Aside from it taking place at all, do you know why they changed the original route which apart from the boules area just followed the carriage drives? Why did they have to go into the Rosery car park area and the athletics track staff car park necessitating the removal of grass and hedges? I did know that. It’s important to remember that that was the original proposal, which also gave a clockwise direction. My guess is that to be safe to race on, they had to reverse the direction to anti-clockwise to allow for run off space at the gates. This meant that they would enter the right hand turn after the Rosery car parks at full speed which would be unsafe for al involved. This is why they needed to have the chicane into the car park area and the athletics track area to make pit entry safe. It sounds like they’re doing it for the sake of it but from a circuit point of view it’s better, safer and makes complete sense. Yes. The original proposal was also clockwise. 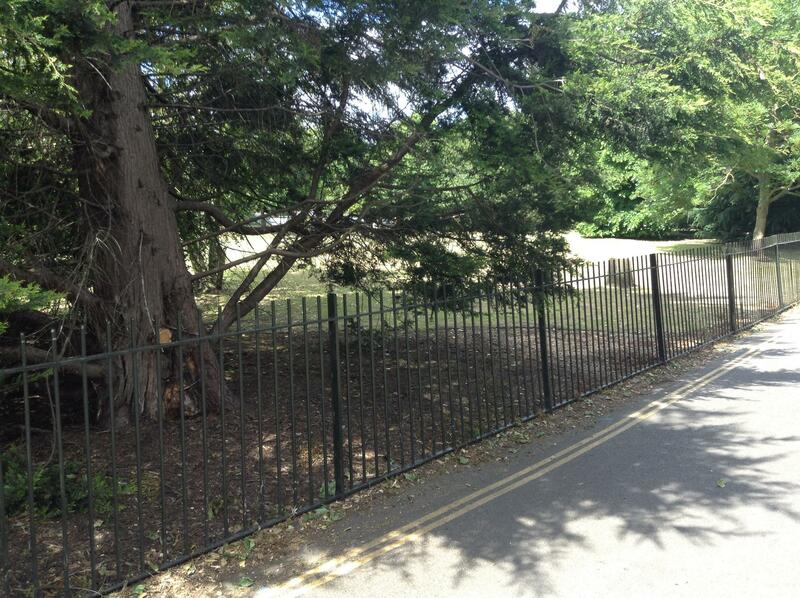 A change to anticlockwise was made to be safer for the cars, providing run off at the gates. This meant they would approach the right hand long sweep after the Rosery car parks at full speed, so needed a chicane. One was also needed at the Athletics track to make pit entry safer. It sounds like they’re doing it for the sake of it but from a circuit point of view it makes complete sense. Much safer. This quotation from the Heritage Impact Assessment demonstrates the risks the Council have been prepared to take for the sake of very little money. – recommendations, proposed mitigation measures and officers’ comments. 1). Avenue Trees – Risk of permanent damage and ultimate failure of trees as a result of construction works, excavation compaction and damage to tree crowns. The trees considered at greatest risk are those on Carriage Drive West located adjacent to the chicanes at Turns T05 and T06 and Turns T07 and T08. Around 14 trees (double avenue of London planes and Turkey oak). Other general construction works and heavy vehicle movements present the risk of compaction and other damage to the tree crowns and canopies. Safety fencing and grandstands to be located around the circuit. 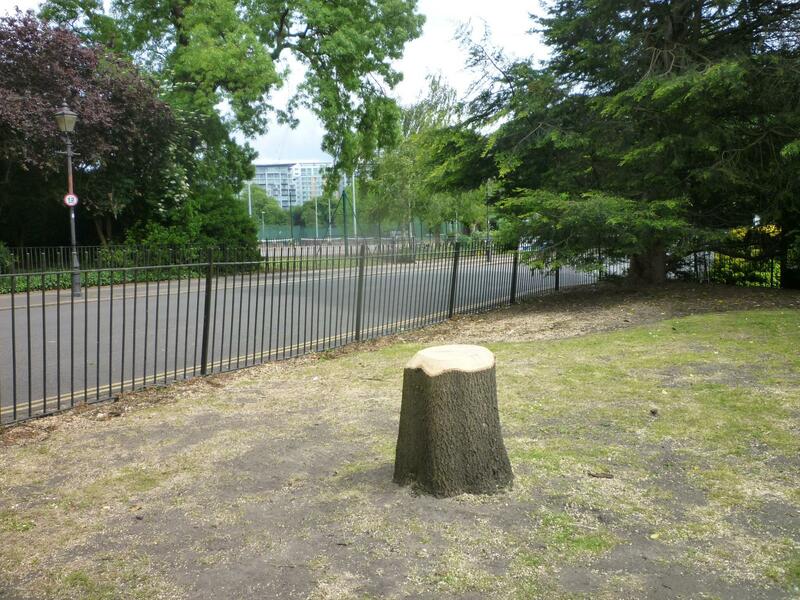 Loss or failure of any avenue tree would have a major adverse impact on the designed historic landscape of Battersea Park and would, effectively be permanent, with a timescale of at least 150 years to replace the lost asset. Evidence of damage, in particular to the root system or from compaction) may not become apparent for several years after the event. Damage to tree canopies would have a minor to moderate adverse impact on the designed historic landscape and could, potentially affect the overall appearance of the tree, for instance if a large limb had to be removed. Tree survey and assessment of all Avenue Trees in accordance with BS 5837 ‘Trees in relation to design, demolition and construction recommendations’. Construction methodology statement(s) and tree protection to meet requirements of BS5837. Where requirements cannot be met review design/proposals and construction methodologies and revise as necessary. All concrete safety fencing and guard rails to be installed on areas of existing hardstanding. No heavy vehicle movements to be permitted within tree protection areas. Installation of grandstands within tree canopies not to involve any excavation. Provided method statements and tree protection measures are put in place which comply with the requirements of BS5837 and are fully supervised by an appropriately qualified arboriculturalist, and other requirements set out above with regard to construction works, installation of safety fencing and grandstands, the risk or likelihood of long term damage and failure of avenue trees can potentially be reduced to an acceptable level. The greatest potential risk remains to the trees on Carriage Drive West, where excavation will be required within the root protection zones of an estimated 14 trees, together with other locations where the circuit is to be widened on Carriage Drive East and the pit access off Central Avenue. 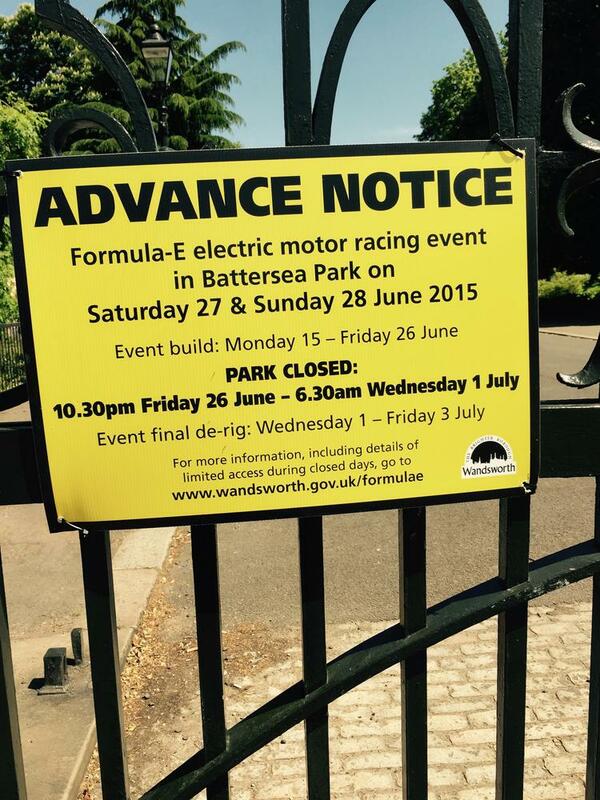 Some slightly more positive news, WBC have confirmed today that they are amending their recent planning application for 2016 & 2017 events in Battersea Park so that it now excludes Formula E to allow the impact of this years event to be fully assessed and hopefully to allow local consultation to take place. That’s good. I wish the WBC would be a bit more transparent. Thanks Ben for the info….may be good for the circuit but not so good for the park I suspect. Local campaigners have reacted with alarm to the news that former FIFA chief, Sepp Blatter, is to take over as the new head of the Battersea Park Formula E project. It’s understood that Blatter’s first move, acting in tandem with the local council, will be to have all opponents of the plans culled and rendered down to biofuel for the race cars. Some amusing black humour. However, the Motor Show is coming to the park next year, and from a letter to Planning from FBP , it looks as if there is a suggestion that cars will be road tested. Has anyone seen the Park lately? Looks like a gulag, and it is very obvious where they have widened the once elegant south carriageway. Lorries knocking off leaves and small branches as they travel along, loaded high with equipment. Paths blocked off to the public. I guessed it would be ugly, but nothing like this. And the council still insist it is an improvement.